The Alta 2 is Oticon’s top of the range hearing aid. It includes all of the premium features for the ultimate in hearing clarity in groups and background noise. Alta2 is available in a range of discreet colours and styles from the Invisible-In-Canal (IIC) to high power Behind-The-Ear (BTE) for even the most severe hearing losses. Oticon’s specialised sound processing system which preserves the natural details of the speech sounds to maintain exceptional speech clarity in all situations. When you wear two hearing aids, they both communicate with each other to help you determine which direction sounds are coming from, which then allows your brain to decide where to focus its attention. Designed to mimic the ears natural ability to focus on sounds coming from the front for better speech understanding in background noise. 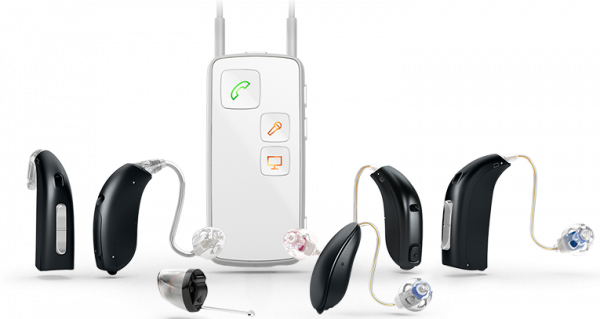 The Oticon Alta2 Hearing Aid has 5 modes of directionality for the highest degree of individualisation. Not only is each person’s hearing loss different, but so too are their listening preferences and abilities. The Alta2 YouMatics system allows for up to 15 different levels of customisation for each person. ConnectLine perfectly complements your Oticon Alta2 hearing instruments by allowing you to wirelessly stream phone calls, TV, music and many other devices directly to your hearing aids. The key component of ConnectLine is the Streamer Pro, a convenient, lightweight device looks similar to an MP3 player, the Streamer is worn around the neck, and features 3 dedicated buttons for the core applications: phone, TV and microphone. The new ConnectLine App for iPhone® takes your experience to the next level. Using the ConnectLine App for iPhone you can set the sound levels for your phone, TV, music and any other devices you are connected with.